This tournament organize by KELAB CATUR AIZEK (ACC) DAN UNIT SUKAN CATUR SEKOLAH MENENGAH KEBANGSAAN TENGKU INTAN ZAHARAH, DUNGUN, TERENGGANU. Time: 8.00 a.m- 6.00 pm. 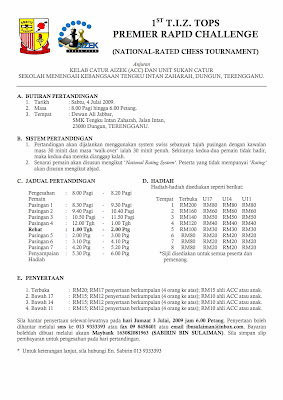 Pls submit your entry before 6.00 pm , Friday 3rd July, 2009. 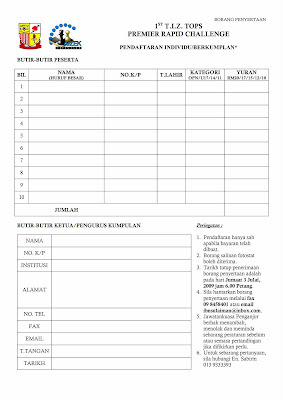 All entry can be make by sms to 013 9333393 @ fax 09 8458401 @ email at ibnsulaiman@inbox.com. All payment can be make via Maybank account 163082081963 (SABIRIN BIN SULAIMAN). Pls keep ur bank slip and show it at tournament day for confirmation.